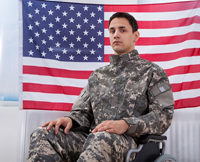 If you are a military veteran that needs legal assistance in the area of health care law, you may contact one of the listed legal resources. Founded in 2000, the Alona Cortese Elder Law Center provides free legal services to low income seniors throughout County of Orange. The center works closely with local legal aid organizations and pro-bono attorneys to maximize services provided to seniors. Through a partnership between the law firm of Gibson, Dunn & Crutcher LLP and the University of California at Irvine School of Law, the UCI Law Veterans Appeals Pro Bono Program provides pro bono representation to veterans in appeals of veterans benefits claims to the United States Court of Appeals for Veterans Claims. Contact Sean Twomey at Gibson, Dunn & Crutcher LLP at (949) 451-4055 or stwomey@gibsondunn.com for more information. The Office on Aging provides services for older adults, caregivers, and persons with disabilities, which includes veterans. Information and referral to services that help people maintain their independence is provided through the call center. Links to resources include, but are not limited to, nutrition, transportation, health insurance counseling, support groups, case management, legal services, in-home care, and adult day care. The first program of its kind in California, this veterans court is a dedicated criminal calendar offering therapeutic treatment instead of incarceration for combat veterans. The first-time offenders served by the court have disorders arising from combat experience, including substance abuse issues, diagnoses of posttraumatic stress disorder, traumatic brain injury, and other psychological problems.